And now, before I present you my gallery, here’s a little information about Divinity’s Reach. 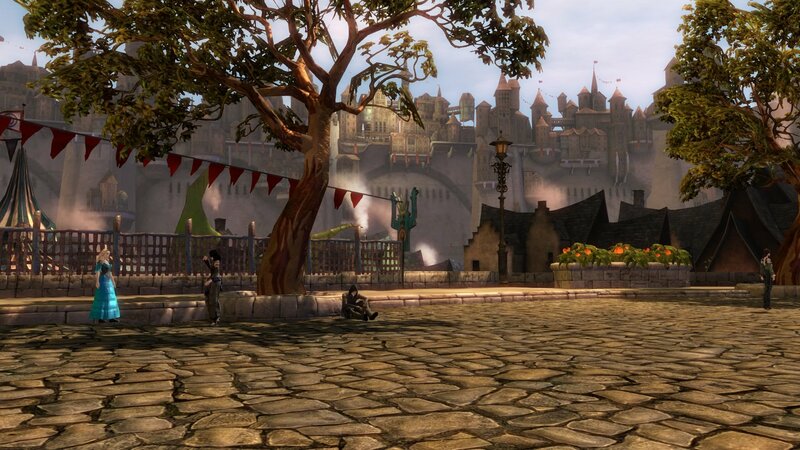 Lion’s Arch had been the capital before but Divinity’s Reach took its role after it had been flooded (by the rise of Orr). The Wiki describes the city as a melting pot with residents coming from Cantha, Elona and Ascalon. I was in a part of the city where my Elonian warrior would feel right at home, I think. It’s a bit difficult for me to say which picture is from which district of the city, though, as I was walking through it without my interface showing up and without staring at the map all of the time. But as usual with the Wiki, you can find plenty of information about the city and its areas there. Edit (August 3, 2013): Something changed in Divinity’s Reach with the July release. This is the area of the Great Collapse. I will admit my first reaction to Divinity’s Reach was the same as yours. Sure, the architecture was nice and it looked more like a city than the usual “cities” in other MMORPGs, but it was still just a medieval city, right? Awesome pics! DR is such a monumental city, they’ve certainly shown all other MMOs their place in terms of scale and details. One issue I do have with it though now that I’ve also traveled it myself, is that it’s almost ‘too big’; certainly for any type of medieval looking town (which would be narrow streets, close buildings etc.). the streets are so incredibly wide and the gates are so high that you wonder what giants the city was built for lol. :) I like the epicness, but I keep thinking the proportions are way off – it’s easy to feel lost in there. TY for taking such care with the framing and selection of views. I really enjoyed the nostalgic feeling these gave me, and they are very well done indeed. Awww, sorry about making you feel homesick. ;) I don’t have that feeling yet as I’m still waiting to set foot into Rata Sum… although I have really fallen in love with Lion’s Arch and I can see myself spending lots of time in there.